Tomorrow, the House will debate a bill that would allow DC to display a single statue in the Capitol’s Statuary Hall, instead of the two that were proposed in a bill earlier in the legislative year that Congress did not pass. 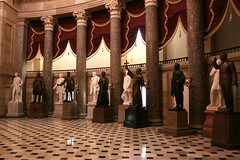 Norton said in a release this morning, “Its federal taxpaying status entitles the District to two statues, like other jurisdictions that pay the full freight to support our government,” but welcomed the ability to display one of the figures central to the role of the District in Statuary Hall. The figure will be either Frederick Douglass or Pierre L’Enfant on behalf of the District. You can see their current statues at One Judiciary Square.